Now I know you North East brides already have a very busy weekend ahead of you, but before popping into our newest SUPER SHOW on the block – The Brides Up North Bridal Bonanza Grand Wedding Exhibition – on Sunday (have I mentioned that a few times? 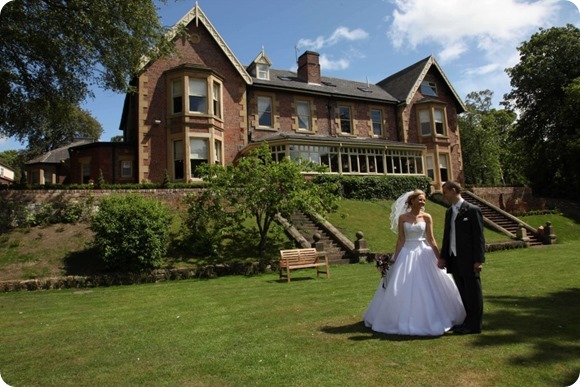 ), why not spend your Saturday paying a visit to rather lovely Brides Up North Featured Supplier Eslington Villa’s Wedding Open Day, this Saturday 23rd February 2013 from 12 noon until 3pm? Melanie at this gorgeous private wedding venue says: We know that so much detailed planning goes into organising a wedding, so we are here to help our brides and grooms along the way, we want to ensure your big day is everything you dreamed it would be. Don’t miss the opportunity to view Eslington Villa at our Wedding Open day and talk to us about what would make your wedding perfect. We hope to see you there! Eslington Villa is a family owned and run hotel and restaurant in Gateshead. Nick and Melanie Tulip bought the hotel in 1987 when it had six bedrooms and a small dining room. Twenty five years later the hotel has eighteen bedrooms, a ninety seater restaurant with additional private dining rooms and extensive grounds. Melanie says: When you come to Eslington Villa, you’ll feel at home as soon as you arrive and like an old friend as you leave. Whether you’re staying in one of our beautiful rooms, dining in our award winning restaurant or hosting a part, your comfort and satisfaction are at the heart of all that we do. Eslington Villa offers a unique blend of professional and friendly attention, relaxed yet stylish surroundings and a secluded but central location. Many of our staff and management have been with us for a number of years and this experience combined with our 27 years of running the hotel and restaurant guarantees a high standard of service and attention to detail in everything we do. If you’re looking for a relaxed and more informal venue for your wedding reception, Eslington Villa is the perfect place for you to celebrate your happy day. From a small intimate evening reception, to a full day at the hotel including wedding breakfast, evening buffet, accommodation for guests and even a marquee in the garden, we will help you to plan the event that is right for you. For more details about the beautiful venue or their Wedding Open Day this Saturday visit their website or contact Melanie at home@eslingtonvilla.co.uk or on 0191 487 6017. Enjoy! And I’ll see you on Sunday (you know where)!